This is a great opportunity to try out the entire F-One lineup, starting with the SUP in the morning, and moving on to Kiteboarding action in the afternoon, with the Bandit 6, All twin Tips, Surfs (fish,etc...). At this point, the forecast looks promising. We hope that all bay Area riders will join us. Hoping to be down there on Sunday to brave a little rain for some wind. Need to get out on the water though so I've got a frame of reference comparing the four against the new six, hopefully it'll be blowing for awhile. I'm curious if there's any kind of criteria for demoing a board/kite as I've never gotten the opportunity. I do promise to not forget my safety leash and end up with a runaway kite heading to Oakland Airport. Anyone witness that joy last year at 3rd? Is Bruce going to be there? 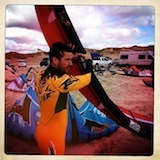 If the wind is too mellow, could be a good day to try out SUKing on the Source kite and a SUP. I will always always always prefer proper kiting, but family reunions on New England beaches in summer always seem too be too mild to kite... and there's that rented SUP just sitting there waiting to be shredded. forecast looks great as of now! We look forward to seeing everyone for our F-One demo this weekend! and yes Bruce will be there! Yes , i will be there - both Saturday and Sunday. Jane , rev up that BBQ !! Forecast is looking good . See you there saturday morning. I will make it at least one day. Wanna give those Bandits a test dance. SUP tomorrow and maybe , just maybe , get a little wind.